When I buy a product for the site, I always try to pick things that err on the side of ridiculous, whether it’s a quirky ingredient, stupid slogan and/or mascot or a terrible Flash-based website that’s straight from the 90s. In this case, today’s feature drew me in because: the word “SEA” in the name (the sea is delicious, no?) 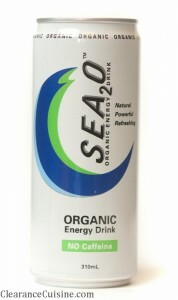 and the concept of a non-caffeine based energy drink. After flipping the can around, I learned it also has ~organic seaweed extract~ which sealed the deal for me. Sea2O is based locally in Bellevue, WA but I found the drink locally at Big Lots, a stark change from its suggested retail locations like Whole Foods and Metropolitan Market. The can used the word “Organic” probably around twenty times, but I lost count by the time opened the can. While I have no qualms about organic ingredients, once enough is fine for me thx. The drink is very similar to the Capri Sun pouch drinks I grew up drinking as a kid, probably due to the sweetener (agave nectar). Though it’s touted as an energy drink, I’m of the mindset that anything you add enough sugar to, whether it be table sugar, HFCS, agave and what have you, can become energized (new marketing idea: pixi sticks as energy powder). For those asking if the drink was salty or fishy, I’m happy to confirm that there’s no seaweed taste or essence, since seaweed extract is added as opposed to the nori you’re used to wrapping around your sushi. That said, I’ll stick to my artificially sweetened, caffeine saturated energy drinks. This entry was posted on Monday, October 15th, 2012 at 7:00 am	and is filed under Drinks. You can follow any comments to this entry through the RSS 2.0 feed. Both comments and pings are currently closed.